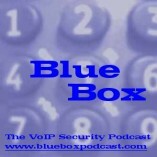 UPDATE 9/24/2012 - All Blue Box episodes are now back online. If you are trying to listen to any of our old Blue Box shows, unfortunately it seems I missed an email alert and the payment method expired for the service I use to host the media files. I am in communication with their billing department now and expect to have the matter cleared up tomorrow with the shows available again. My apologies to anyone who was trying to listen to one of the shows. I will get them back online as soon as I can.